SystemVersion – When numbers are not what they seem! I recently moved to OS X Yosemite, and once again repeated the annual cycle of wondering whether or not my existing solutions will be compatible with the new version. 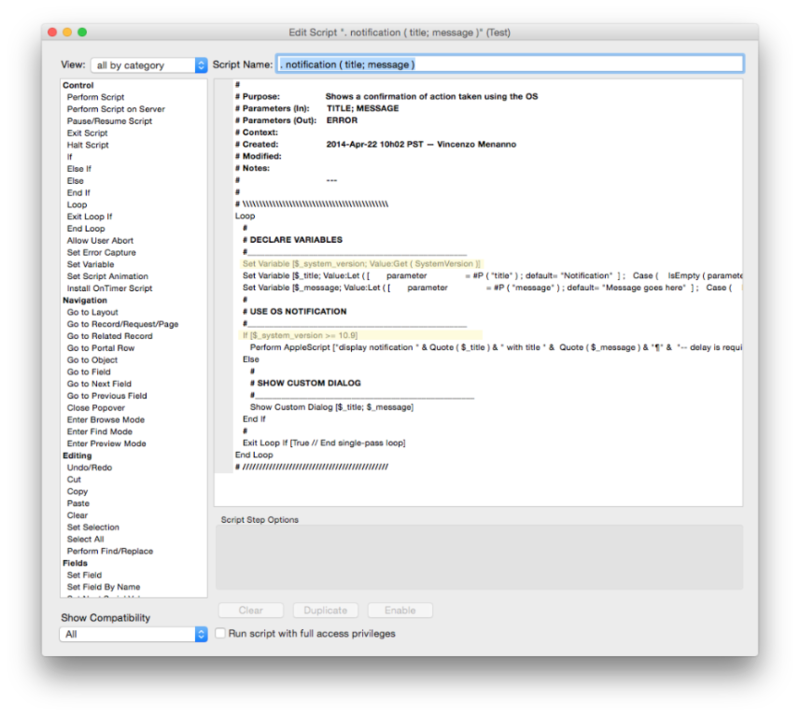 I’ve loved using AppleScript to trigger OS X Notifications from FileMaker since they were introduced in OS X Mavericks, but they stopped working as soon as I installed Yosemite. I still check system version so I can show a FileMaker Custom Dialog for users who don’t yet have that feature. But Yosemite’s version number broke my check! The version “numbers” returned by Get ( SystemVersion ) are actually text data, technically speaking, so “10.10.1” is actually less than “10.9.5”. Just think about how alphabetical sorting treats this: The first “letter” 1 matches from both strings, so we move on to check the second character 0, which also matches for both strings, and the third, until we get to the fourth “letters” 1 vs. 9. 1 is less than 9, so “10.10.1” is less than “10.9.5”! Yosemite = 10.101 and Mavericks 10.95 — Mavericks still wins! Our custom function master Will Baker wrote this custom function to address this issue. PURPOSE: Return System Version as a numeric string, even if there are two decimals in it. 2015-01-07 14:20 PST – Will M. Baker. Created. This function forces the secondary and tertiary components of the version number to use 2 digits each so that “10.1001” is greater than “10.0905”. Here is what the corrected script looks like, and now notifications come through again!